There is something to admire about old photographs – their scratched surfaces, torn edges, tint color stains. Though most of us do not have the dark rooms of the old days, not to mention a film camera, using software to make digital photos look like as if they were shot from film cameras is quite popular nowadays. Earlier this year Lomography has gone even further by launching a Kickstarter campaign to fund its production of the Daguerreotype Lens for modern cameras. 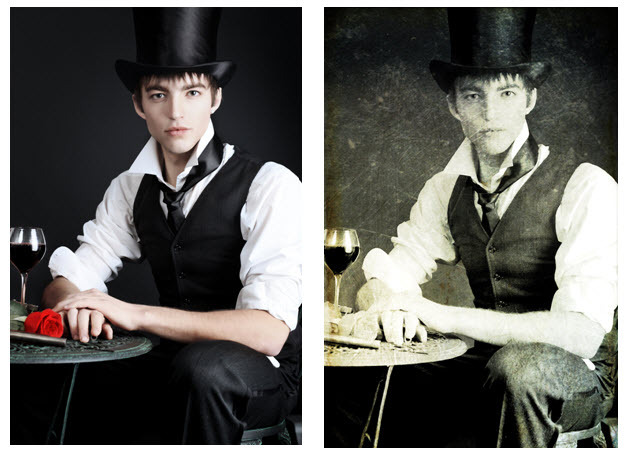 The Lens aims at bringing back the look from Daguerreotype processed images – the first publicly announced photographic process in the history of photography, invented by Louis Jacques Mande Daguerre in 1839. Each daguerreotype is developed with a complex process on a silvered copper plate producing a unique aesthetic look. 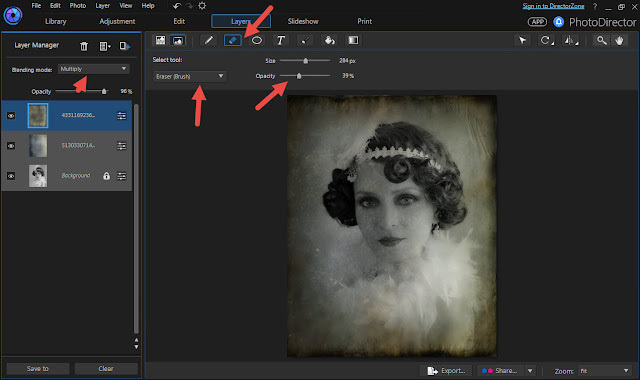 Thanks to today’s technology, we can bring back many of its characteristics found in the Daguerreotype image just by using PhotoDirector. In this tutorial, we’ll show you how. Back in the 19th century, the daguerreotype images were taken with long exposures, so if there are clouds or water in your photo, make sure they are blurred with movement. If there are people in the street, make sure they are eliminated. If you select a portrait, make sure the person is in a position that can be stable for at least 30 minutes. Yes, that was how long a photo was taken back in the days. No wonder, portraits had a solemn look, and in a sitting position. They simply can’t move much or the whole picture will be blurred. So, if you are to shoot your image and emulate the daguerreotype, make sure to take long exposure images. 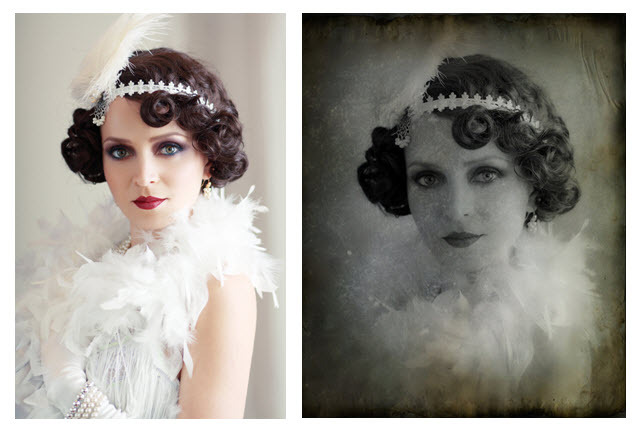 In this tutorial, we will use the image of a portrait taken from a modern camera. 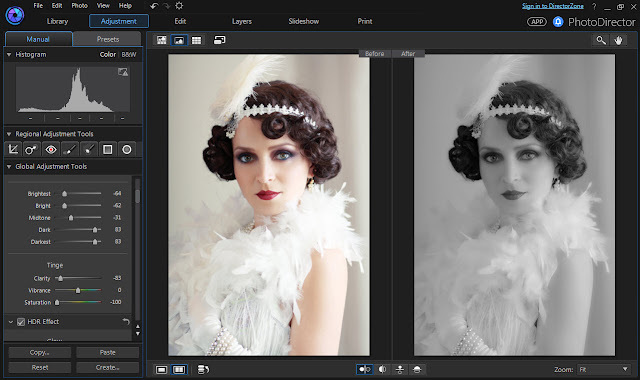 There is more than one way to convert a color photo into Black and White. There is another tutorial for this topic. In this example, I de-saturated the image and made further adjustment to the highlight, shadows and midtones to darken the overall look. The photo also looked too sharp so the Clarity is dialed down too. Before moving to the next step, I find the dimension of this photo doesn’t seem right, most old photos use a 4×5 ratio. 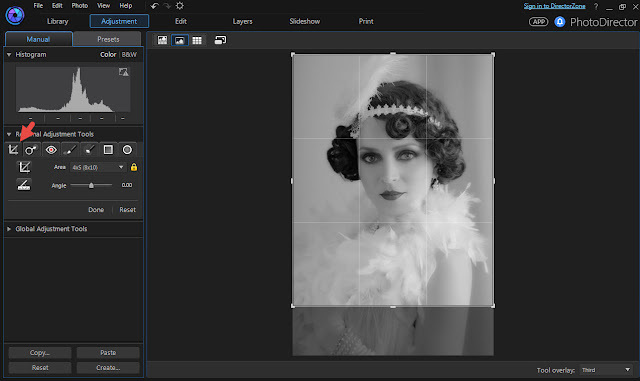 By using the Crop tool, the image can be easily adjusted to the desired ratio. There are lots of free texture images on the Internet. Google search “scratched metal texture” and you will come up with some pretty cool sites that offer texture images for free. Make sure you read the guidelines and instructions so you do not infringe copyright. 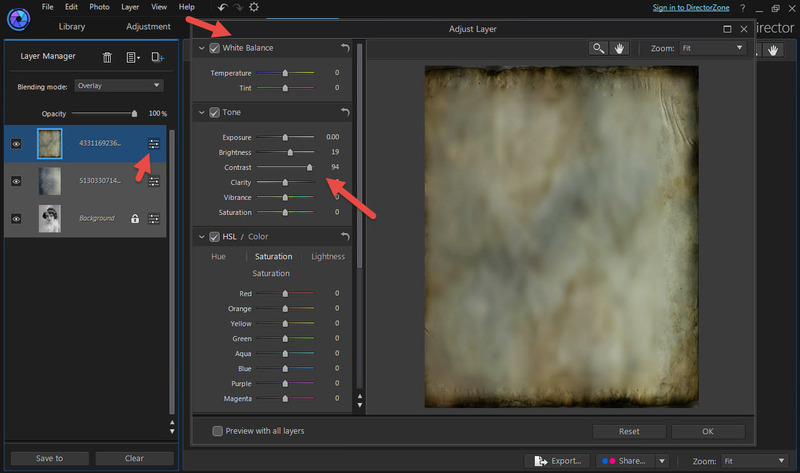 I downloaded a couple of texture files from the websites below. They offer some for free. One of the texture layer had a nice ragged border, however, it was not dark enough. You can adjust tonality of the texture file by clicking on the adjustment button and the “Adjust Panel” will appear. Now, I change the Blend mode for this layer to “Multiply” in order to get the ragged border look. And by using the Eraser brush to remove the yellowish parts that is covering the face. I chose a medium opacity so the transition is much gradual. 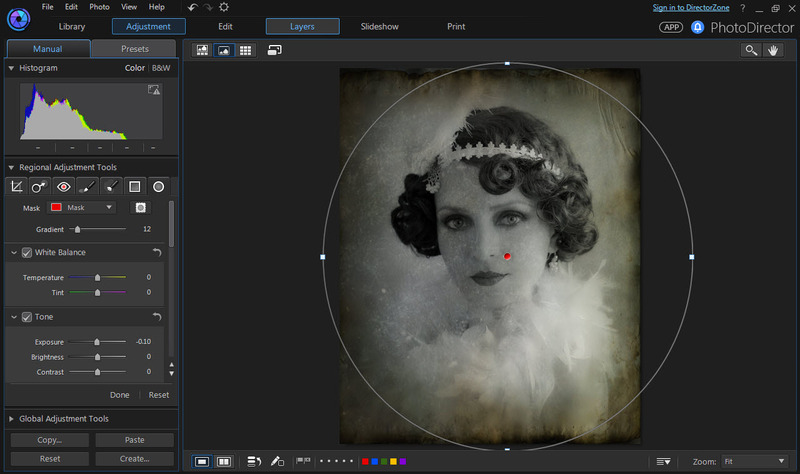 Lastly, go to the Adjustment Module to add a vignette using the Radial function. The Radial function gives you an off-center vignette. Dial down the exposure and the borders will darken. 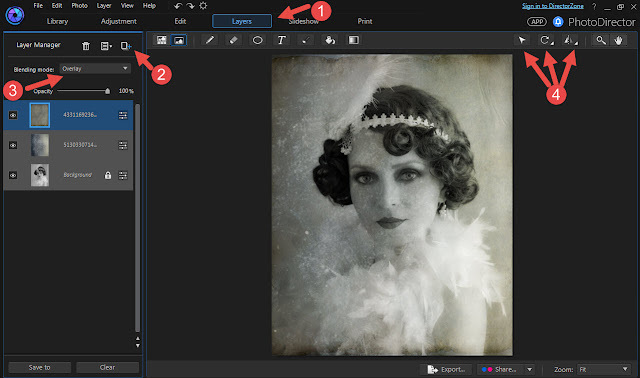 Another example with a Before and After editing to create a Daguerreotype effect. Now try this effect on your photos. You can also try a landscape image too. NOTE: CyberLink reserves the right to share your personal information with third parties. CyberLink is not responsible for damages to hardware or lost data. By using CyberLink software, you agree to waive your rights as a consumer.